Any budding video producers here? WIN £500 of Addict Kit - Kmag Bungle Video Comp. I just thought I'd let you know about a music video competition we (Knowledge mag) have launched with Bungle, Spearhead and Addict Clothing. The winning video will be used as the official music video plus there is £500 of Addict clothing for the winner. If you've ever fancied yourself as a music video director, or thought you could do better than videos you've watched, now's your chance show everyone what you've got. Entrants are invited to submit their videos for the track 'The Siren' by Bungle ft. Ayah, the first track from the Bungle album forthcoming on Spearhead, you can download the track for free here http://soundcloud.com/knowledge/bungle-the-siren-ft-ayah. Next, film and / or animate a video using your own footage, edit it and finally upload it to the Vimeo competition group. There's no brief, the advice given is to use whatever equipment you've got. You can even use your mobile phone and edit it in iMovie, just be creative and use your imagination. The winner will receive £500 worth of Addict Clothing of their choice and their video will be used as the official music video for the track. The deadline for entries is midnight (GMT) September 18th and the winner will be announced by September 26th. drumnbass.be forum » Production » Competitions » Any budding video producers here? 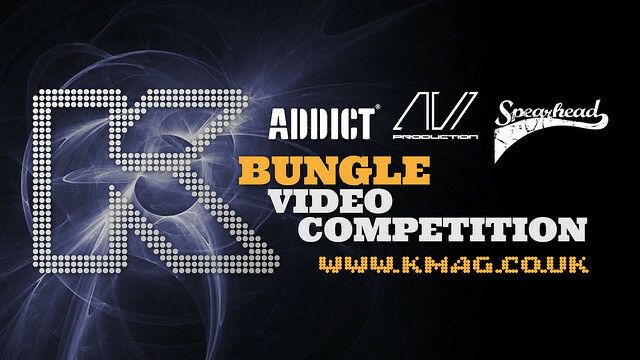 WIN £500 of Addict Kit - Kmag Bungle Video Comp.